StoryTelling has always been a part of our integral design as human beings. Our primordial gatherings around the fireplaces of our families and tribes, were the meeting point where all stories were shared…where all things meaningful and that truly mattered to us were told through living Story. In recent times, the importance of StoryTelling has resurfaced as a key way for us to connect, share and learn from each other. Everywhere from large corporations to small workplaces, people are engaging in StoryTelling as a way to define a common story and a common path to their business success. Mindfulness, and its various forms of practice to centre our thoughts into the moment of our being, is today being practiced by leaders of some of the largest corporations in the world, but, recently, through the advent of a number of projects, it has also found its way to the doorsteps to the mainstream of elementary schools. Can the practice of StoryTelling and Mindfulness combined, mark the beginning of a new way of thinking and acting together on our planet? Could practicing a combination of StoryTelling and Mindfulness amongst our families and with our children be the keys to nurturing a generation that will take seriously the importance of creating a life where your happiness and your work are one and the same thing? 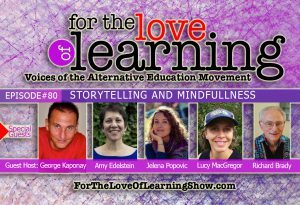 How is StoryTelling and Mindfulness being practiced in Alternative learning communities and could this be something that might transform the more traditional approaches to education? How are some practical projects and approaches contributing to the spreading of these two vital practices in the areas of alternative learning? Where can we as families and global communities benefit from immersing ourselves in learning about and integrating the practice of StoryTelling and Mindfulness? These is the topic and questions we will be exploring on our panel show StoryTelling and Mindfulness – The Key Practices to Creating a New World of Learning. Amy Edelstein, educator, author, and public speaker is a powerful communicator of ideas and beliefs that can help us transform ourselves and the culture we live in. Amy is founder of the Inner Strength Foundation, a non-profit organization that supports teens through mindfulness and cultural development. Over 2000 at-risk high school students in Philadelphia have participated in its flagship 12-week program, cultivating inner strength for outer stability. Currently the subject of a research study by Syracuse University, whose pilot already showed significantly positive results, this program is committed to long-term transformation and evidence-based results. Amy is also co-founder of Emergence Education, which produces transformational programming and publications for an international audience. A Cornell University College Scholar, Amy has thirty-five years experience with in-depth contemplative practice. She is author of Love, Marriage & Evolution, Great Awakenings: Radical Visions of Spiritual Love & Evolution, Inner Strength Teen Program Teacher’s Manual and a book of poems entitled We All Come from Somewhere. Jelena Popovic is a best described as “hearticulator,” who inspires others to search for their inner genius with curiosity and compassion. She is mom, life-long learner, school psychologist, mindfulness educator, believer in meaningful relationships and the immense power of love. Jelena’s mindfulness practice consists of yoga, continuous curiosity and awe about the mind as well as heart opening practices through storytelling. She earned her graduate degree in school psychology from Tufts University and her career focus has been on school based mindfulness interventions, brain based and social emotional learning, culturally competent practices, educators training regarding stress reduction and interdisciplinary collaboration to promote mental health wellness in schools. She is a Mindful Schools Year-Long Graduate and mentor, teaching mindfulness in the classrooms from Pre-K to high school in South and North Carolina, conducting mindfulness based small group sessions for children at public and private schools, doing teacher and parent workshops, teaching mindfulness to grieving parents, incarcerated youth, grandparent and pregnant teens support groups, and presenting at state conferences about the science and benefits of relaxation and mindfulness in education as well as passionately advocating for culturally responsive teaching and assessment practices. Jelena is honored to be certified as the first Relax Kids USA Teacher Trainer offering training to adults who wish to learn the Relax Kids method. In June 2016, she co-facilitated the first South Carolina Mindfulness for Educators Retreat sponsored by CERRA and Newberry College Department of Education. Her next adventure is leading a yoga, storytelling and mindfulness retreat with her aunt in Bali in May 2017. 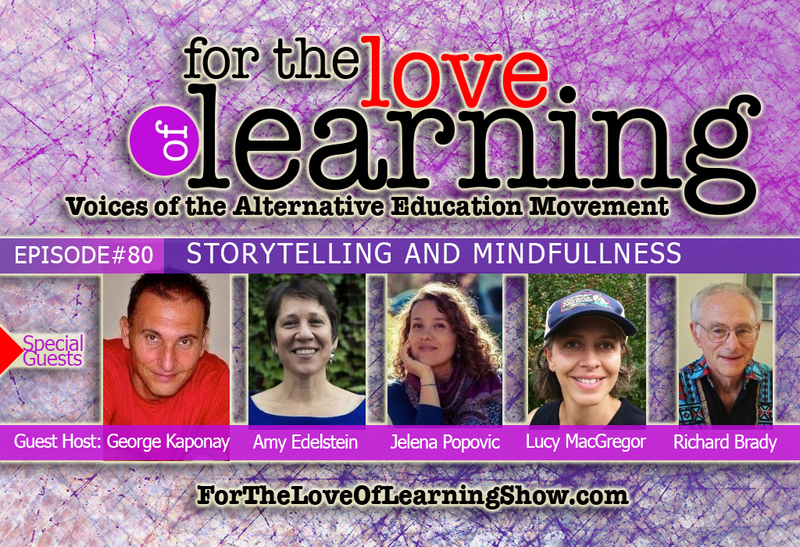 Lucy MacGregor is a teacher and mindfulness educator. She completed her undergraduate studies in Sociology/Social Work and has worked for many years in education settings including public elementary school programs, therapeutic programs for adolescent boys and girls, and in experiential education programs for elementary and middle school classes. Additionally, she is a trained Montessori Children’s House guide. Lucy has had a daily mindfulness practice for many years. She is a Mindful Schools mentor and Year-Long graduate (http://www.mindfulschools.org/) trained in teaching mindfulness to children and adolescents and is a certified Children’s Yoga Instructor. She has taught mindfulness to children and adolescents at four schools and has introduced these techniques to teachers in conference and workshop settings. As a past Outward Bound Rock Climbing Instructor, Lucy knows the growth that can occur in challenging natural settings. She co-leads girls aged 6 to 12 in collaboration with Asheville Taasc, an adventure and service program, to support girls in creating empowering stories about themselves and to relate to themselves with self-awareness and compassion. Lucy moved to Asheville 11 years ago and lives with her husband, her son and daughter, and their many animal friends. Richard Brady is a retreat leader, writer, and educational consultant. He is a founder of the Mindfulness in Education Network, an international organization with 1,700 participants. Richard taught high school mathematics for 37 years. In 2001, he received lamp transmission from Zen master Thich Nhat Hanh to be a Dharma teacher in his tradition with a special focus on cultivating mindfulness in young people. Richard has lead retreats and offered workshops for educators in the US, Italy, and Germany. He is an editor of Tuning In: Mindfulness in Teaching and Learning (2009). Other writings of his are available at www.mindingyourlife.net. In 2016 they are engaging on a tour of the UK and USA to promote their 15 year old daughter’s debut novel Dawn of the Guardianwww.dawnoftheguardian.com which was released earlier in the year. George and Bobi are also shortly launching their Labour of Love Incubation Program (www.labouroflove.us), designed to provide a face-to-face, live working forum, intended to assist people, families and groups to find, define. launch and bring to fruition their very own Labour of Love pursuit.